on Nest created as a companion piece. the color palette, and with more blue on the rooster's head and his tail. cowl, with more unpainted ivory left showing on the face. decorated wares with painted designs. (below) Fenton 8-1/2" Standing Rooster, ware 5257 FV, YOP: 1998.
rose, rust, sage painted on the ivory glass rooster. motif on a Cobalt Satin base. 2012, 2013, 2014. All rights reserved. the USA and continue to be highly sought after in new and secondary online Market Venues. Glass Company and its made in the USA wares. roster of logos indicating what each of the various logos represented. 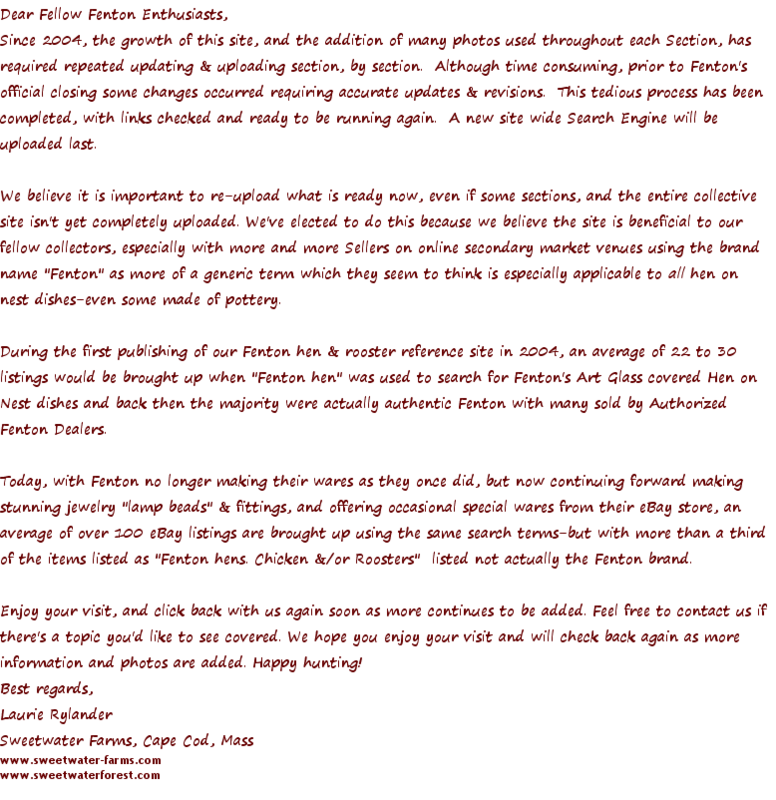 written descriptions, such as those found on eBay, can also be found throughout the site. special order by the Heisey Collector's Association, to be made using the Heisey moulds. conveniently located on the upper left side of each Section. duplicate purchases, or the purchase of a hen or rooster listed as Burmese, when it is not. and all with an interest in Fenton Art Glass! misleading and problematic, to say the least. painted hens and roosters as Burmese, when they are white satin that's been hand painted. notes about the colors and treatments. links up and running again. is applicable to all hen on nest dishes-even some made of pottery. information and photos are added. Happy hunting! (above right:) Fenton Folk Art Hen on Nest, #5186 NH, YOP: 1996. 5"